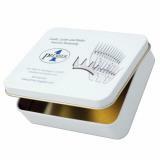 Keep expensive combs & cutters clean, safe, lubricated and organized. Comb/Cutter box only, combs and cutters sold separately. Safe storage and shipping of combs and cutters. Enables safe storage and shipping for resharpening. 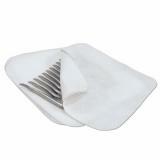 Comes with spun fitted polyester layers to keep combs/cutters separate and provides a protective, oil-resistant cushion. Standard 4 point cutter for shearing machines. Works well with Premiers combs and shearing heads. Rounded tips and long shearer's bevel reduces nicks. For shaping show animals and shearing llamas, goats & coarse wools. For use with a shearing comb. Designed to leave a longer cut. Specialized comb for shearing llamas, alpacas, vincunas, guanacos and camels. Leaves a cover of 6 - 10 mm of hair/wool. Extra teeth reduces risk of nicks and leaves smoother results. Preferred by "pros" because it pushes through the wool easier. The extra wool that it leaves protects sheep from cold and sun. Extra thin. Long tooth bevels. Flared teeth on both sides. An excellent comb for beginner shears. Easy to control while providing a quality finish. Can be resharpened by Premier. All purpose flared comb for small flocks and show animals. Holds cutting edge up to 3 times as long as normal cutters. Specifically made for use with 9 tooth combs like our Apache. Tooth shape enables cutter to run evenly across the comb. For shaping show animals. 20 tooth comb fits Premier machines. Not for against the skin use. Number of reviews: 5 customers reviewed this product. Recommended: 5 out of 5 said they would recommend this product to a friend. Wanted something to keep my cutters safe while transporting and when sending off to get sharpened, and this was perfect. Great. Fits my cutters and combs. Will be getting a second box in the future for mailing in my cutters and my combs for getting them sharpened to keep them safe during shipping. Also keeps them safe and clean in the field when you're shearing, when you need to change your common pattern comb and cutter. Great little box! I'm mailing my combs and cutters in to be sharpened today and I got 6 combs and 7 cutters in a box - wrapped semi neatly in paper towels. Probably best to do 5 of each for storage, but good to know you can get that many in a pinch. Great little box to keep your extra combs and cutters in. Even has little pieces of poly fabric to separate everything. Can easily fit 2 pairs of combs/cutters in one box. Very nice size. It is large so it holds my large combs along with my small ones and it also comes with little pads to put between the blades so they don't rub eachother. Really liked it a lot.